The first of many reviews I hope and boy is it a good one! 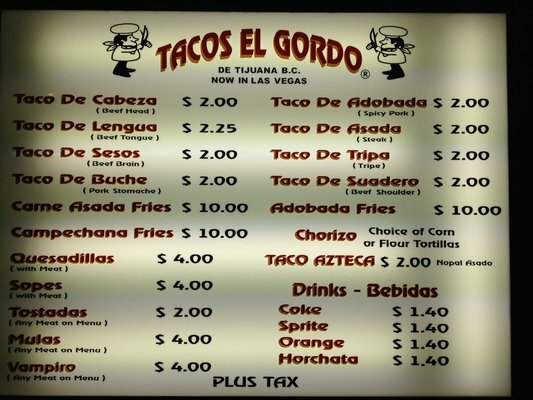 This a hole in the wall taco shop located in a strip mall next to the Wynn hotel and casino on the Vegas strip. I have been to this taco shop more than once because it is just so good. If you are looking for a place that you can get authentic Mexican street tacos than this is the place. I heard about them from one of my coworkers, who said that her and her sister love their tacos and I needed to try them. So luckily for me they were willing to take me on my first visit and navigate the menu and ordering process. Because this is a small place how you order your tacos all depends on how busy the place is. I say this because the very first time I went here it was in the middle of the week and just around 5:30 pm and there was barely anyone there, so we were able to walk right up to anyone and order. Yet the second time that I went which was a Saturday smack dab in the middle of the day the place was packed, wall to wall with people. When it is like this there are separate lines for each of the meat types, so if you want more than one type of taco you have to stand in each line. This can be kind long depending on what you are ordering. Now on to the food! First up here is a shot of the menu; they have one posted right outside of the entrance which I loved because I was waiting for my friends so I was able to peruse what was available. As you can see each taco runs $2 – $2.25 depending on the meat. Then there are different types of fries and what I would consider a tostada, because it is a tortilla covered in meat the topped with another tortilla these run around $4. 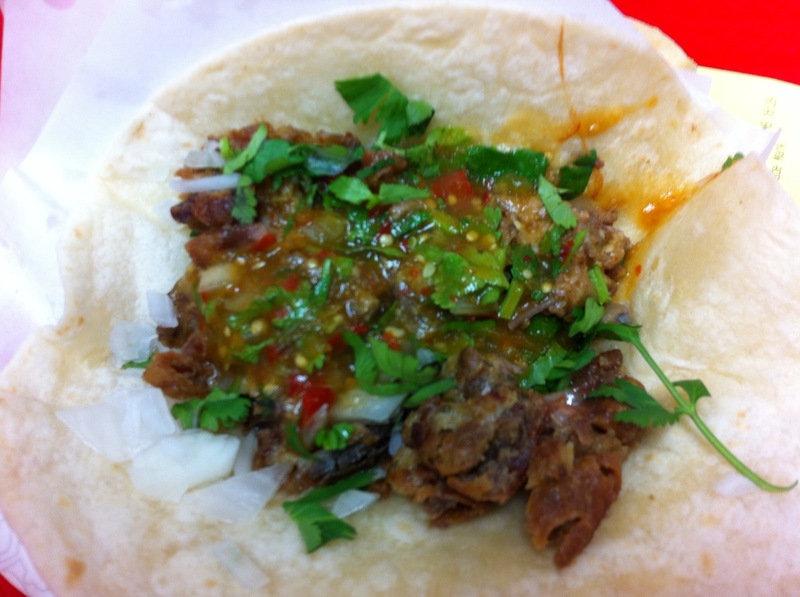 For my first trip here I ordered taco de lengua (tongue), taco de tripa (tripe) & taco de adobada (spicy pork). This was the first time that I have ever eaten tongue or tripe, I figured if I am going to do this I am going to do it right! And my friend was telling me how the only thing she orders is the tongue and I wont be disappointed. I ordered all of my tacos on flour tortillas, the default is corn. I just am not a fan of the consistency so I opted for flour which they graciously obliged. 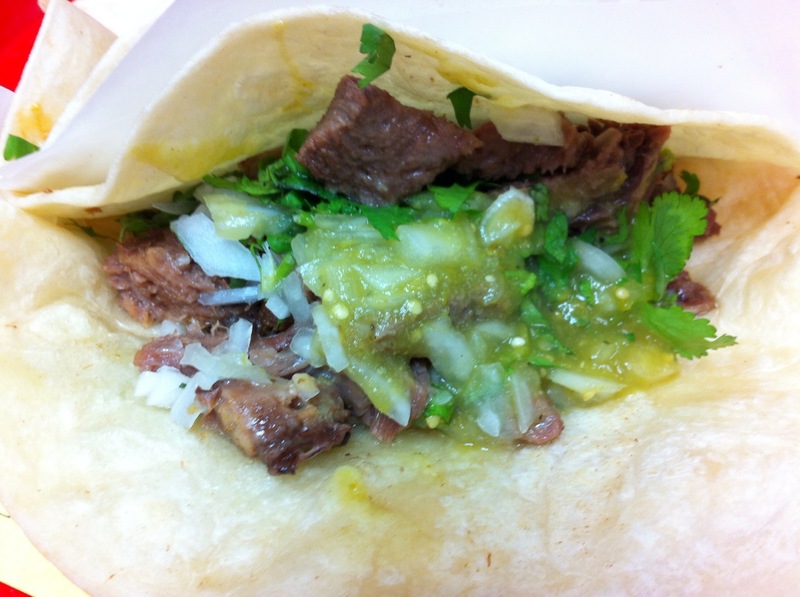 As we can see it is topped with onions, tomatillo green salsa and cilantro. Since this was my very first time eating tongue I have nothing to compare it to but to me it was cooked perfectly. It was nice and tender and great flavor, some bites did feel softer than others. But it wasn’t at all chewy or tough which I was kind of imagining because it is a muscle. Now there was a little too much onions on this taco for my tastes, so in some bites it was a bit over powering. The nice thing was that the salsa and cilantro worked really well with the tongue. Overall it had great balance and I would recommend this to anyone who likes tongue or wanted to give it a shot this is the way to go. Again this is a first for me as well. I have had other people talk about eating tripe tacos and how good they are so I just had to try it at this place. I was not disappointed at all and actually this became my favorite of the night! The tripe had a nice salty crunch then with the salsa and cilantro it was a perfect blend. On my second trip I had three of these that is how impressed I was with them. Now the downside is I do not know exactly what kind of salsa this is but I would say it was along the lines of a tomatillo, it wasn’t spicy but it had a nice mellow flavor so it did not overpower the meat. This is defiantly one to try! 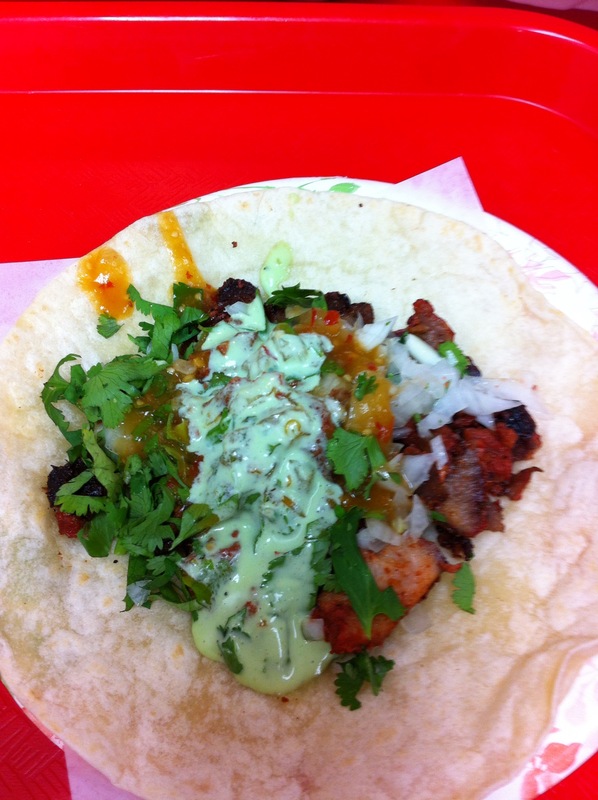 Adobada taco is a spicy pork taco. The meat is roasted on a large spicket so the outside gets all crispy but the inside parts stay nice and juicy. This taco is topped with a traditional salsa and then an avocado type sauce, cilantro and onions. This addition of the sauce created a creamy texture and everything melted together. They were not heavy handed with the onions on this one so for this particular taco it added to the flavor. Now on top of the meat there sits a piece of pineapple which they slice off and put on top of the taco on request. I missed this part my first time there and was a bit disappointed about it, so I made sure to ask the next time I went and that is the way to do it. The pineapple has the roasted sweet flavor that combines with the spicy pork that just works so well together. It is something that at first you wouldn’t think would be good but then once you bite in you realize you shouldn’t have doubted it! 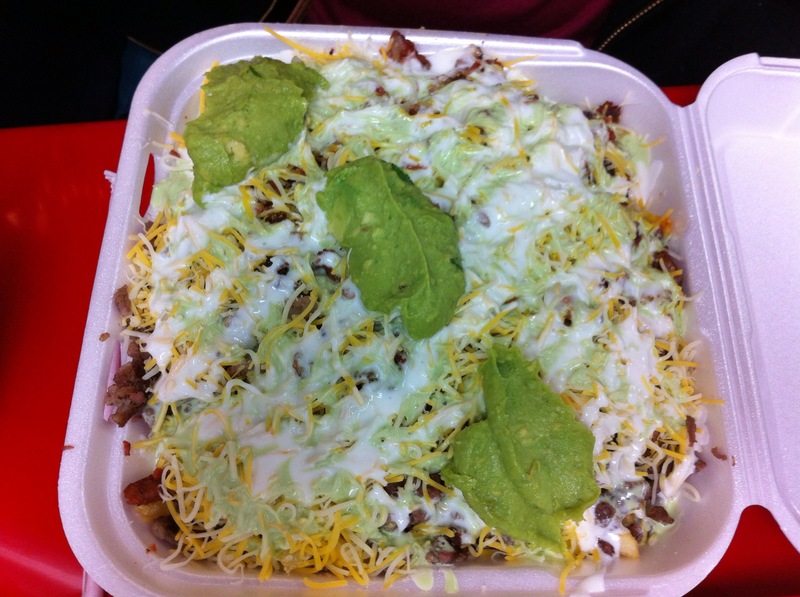 Now for the last and final photo I wanted to be sure to show you what the fries look like when you order them, my friend got the Adobada & Asada fries; it was an half & half type deal and this is what she received. I was pretty full off of my three tacos so only had a couple bites but this was pretty yummy and is certainly big enough to share with the whole table if you wanted. She was only able to eat about a third before she was too full to take another bite. Now for the overall review, the food is great; there is no question on the fact that they know what they are doing. But the restaurant its self is very tiny, there is limited seating and the seating they do have is really small and cramped. So if you are looking for a relaxing place to sit and chit chat this is not it. It is all about the food, you suffer through the cramped seating and hard benches because you know the tacos are going to be worth it. I would like to see them in a bigger space so that they can provide more places to sit so that once you have stood in their massive line for tacos you can actually sit down and enjoy your food. This is the main ding on their review. The other thing I should mention is be sure to as for a fountain drink and not just say a soda. Because I made the mistake of asking for a soda and they gave me a can, it wasn’t until after I already paid and sat down did I realize I had an option for fountain drinks which I would have preferred. Even with the small amounts of seating and my can of soda I was completely satisfied and in all honesty within two days of my visit I was already craving their tacos. Now that the weather is warming up here it is the perfect time to go and enjoy their outdoor seating with some yummy tacos! Be sure to check them out you wont be disappointed.